Ask the average person what a dental abfraction is, and the chances are good that he or she will answer, “I don’t know.” The chances are also good that he or she actually has a dental abfraction and would benefit from one or more restorative dentistry treatments. Indeed, this may be true of you as you read this blog post right now. Dental abfractions are actually among the most common of all dental problems. They are the notches that occur in the teeth at the gum line. At one point, it was believed that dental abfractions were caused by overaggressive tooth brushing; dentists would generally advise patients to change their brushing habits and that their abfractions would not get any worse. We now know this to be incorrect. Without treatment, not only will dental abfractions become worse, but they can lead to such serious problems as tooth loss. Fortunately, by scheduling a consultation to discuss dental damage and dental abfractions with one of our esteemed dentists at our Wilmington, DE cosmetic and restorative dentistry practice, you can help to preserve the long-term health of your teeth and integrity of your smile. 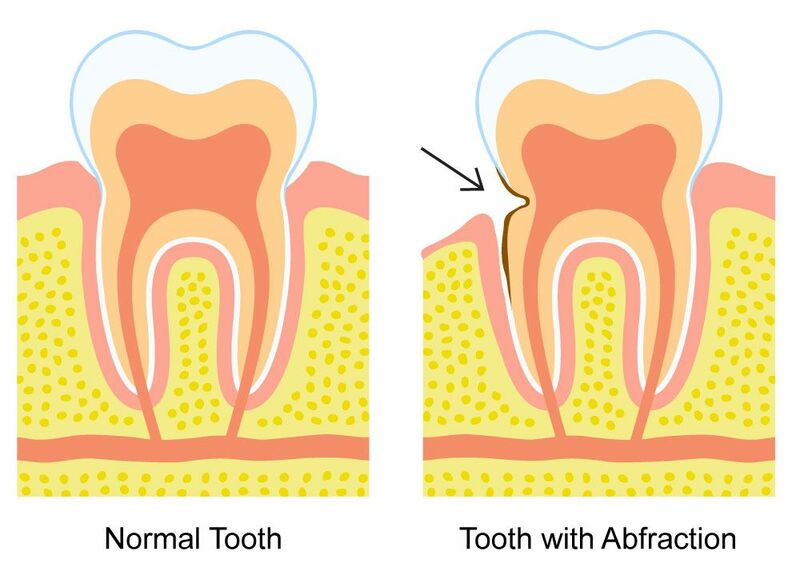 Unlike tooth decay and dental caries, dental abfractions are not caused by plaque or tartar. They are also not caused by overaggressive tooth brushing, as once thought, or even poor oral hygiene. All of these factors can contribute to the worsening of dental abfractions once they have begun, of course; however, they are not among the possible root causes. It is now believed that the two most common causes of dental abfractions are bruxism and malocclusion. Bruxism is the clinical term for chronic tooth grinding. When people grind their teeth, they put exceptional pressure on them. Over time, this pressure can cause the enamel that protects the teeth above the gum line and the cementum that protects the teeth below to crack and become damaged. Notches can then easily form in the more delicate underlying layer of the teeth, the dentin, at the gum line, especially since the base of the teeth bears the brunt of the pressure from bruxism. Malocclusion is the clinical term for a faulty or “bad” bite – in other words, the condition in which the upper and lower teeth do not meet properly when the jaws are clenched. Like bruxism, malocclusion can cause wear and unnecessary pressure on the teeth, especially when a person is chewing. By treating dental abfractions in their earliest stages, our dentists can help to prevent a variety of dental problems, including root canal infections and eventual tooth loss. Treatment options for abfractions include tooth-colored fillings and dental crowns, along with treatment of the underlying issue causing the abfraction (e.g., night guard therapy for bruxism; orthodontic therapy for malocclusion). To learn more about dental damage and dental abfractions, please contact Smile Solutions by Emmi Dental Associates today.